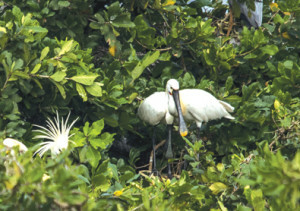 Painted Storks Spoonbill. 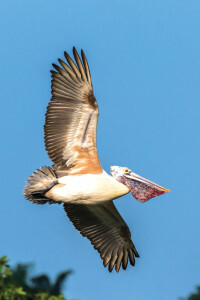 Pelican. 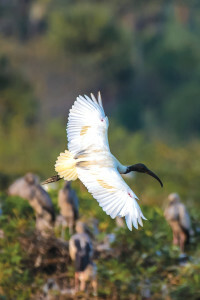 Black-headed Ibis. 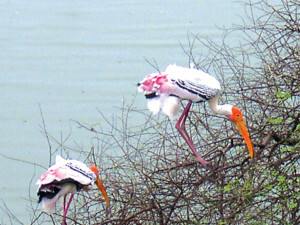 If you went to school in Chennai, chances are you have visited the Vedanthangal Bird Sanctuary, some 75 kilometres south of the city. As an eighth grader, I went there on an excursion. Oblivious to the birds in the distance, my friends and I sat in a circle, chattering away over a picnic lunch. That day trip did not make a birder of me but I now travel to remote areas to spot rare endemics. And each winter, when I visit the old hometown, I am eager for an annual rendezvous with my feathered friends in southern India’s oldest bird sanctuary. With the onset of monsoons in October, the compact 74-acre haven comes to life. Good rains fill up the seasonal lake at the heart of the sanctuary, almost submerging the mini-groves of Barringtonia trees that dot the lake bed. Only the crown branches don’t go under. At least a dozen species of waterbirds – cormorants, egrets, storks, darters and herons among them – will arrive to raise their families in these treetops. The fortress-like setting gives the birds privacy to breed, the “moat” is full of frogs, fish, and insects for ravenous chicks. Everything is lush and green. This sets the stage for some great birding between November and March. Because space is tight in this colony, different species take up residence on the same treetop. Walking along the long tank bund, you can see the motley bunch of waterbirds in this rare, mixed rookery. Apart from this, there are close to a hundred different species of birds in this sanctuary, not counting the migrants. Even bar-headed geese, which fly over the Himalaya to escape the bitter winters of Central Asia, have been spotted here. Local farmers have always been good hosts to the nesting birds, trusty suppliers of organic fertiliser. Fledglings are known to eat more than their body-weight of food each day. After all this feeding, the birds, both parents and chicks, drop guano, right into the seasonal lake below. Farmers use the enriched water to irrigate the adjoining paddy fields. History records that, in the late 1700s, the villagers asked the Collector of Chengalpattu to give them a document assigning the area protected status. No shooting or snaring of birds. Perhaps, they needed to wave this piece of paper at Europeans who showed up for the hunting season. But there is a reason to believe that Vedanthangal has been a haven for birds even before. Why else would they ask the Collector for that document? Was it the goodness of the people, or was it the guano that made them want to protect the nesting birds? It doesn’t matter, because it has been a win-win situation for both birds and farmers all along. Now, a national highway provides easy access to this once-sleepy village and traditions in the region appear to be changing. A study from the National Conservation Foundation indicates that the hunting of waterbirds has gone up in this district in recent times. Researchers reported that the meat from medium-sized waterbirds was sold in the area, between 6 pm and 8 pm, to buyers who specifically sought wild fowl. The rest went to local restaurants and cheaper eateries near liquor shops. Barring news of this disturbing development, you’ll find all this information about the sanctuary, and more, in a slim book called The Vedanthangal Water Sanctuary for Birds written and illustrated by naturalist M. Krishnan. Issued in 1960 and priced at less than a rupee, it should have found a place in every school library. The beautiful prose and the precise details about the natural history of the place could have turned some students into birders. (Such awareness could have also kept children in the area from eating wild fowl later in life.) The book remains an excellent resource though it has no color photographs. The keen-eyed can see fair-sized waterbirds from a distance. Don’t let a lack of binoculars bother you, you can rent them just outside the sanctuary. There is a spotting scope at the watch tower inside the sanctuary. On the walls, there are painted pictures with descriptions, to help you identify birds. You don’t even have to get there bright and early. Show up a good hour before the winter sunset. Take a leisurely stroll, look for some migrants or colourful locals like the coppersmith barbet, flamebacks, the Indian Roller, and wait for the big event of the day – waterbirds coming home to roost. This is not the bright-colored spectacle you will see in some well-produced nature documentary, but it is something to experience. 6394Are conditions for ‘Ease of Living’ poor in State? Are conditions for ‘Ease of Living’ poor in State?